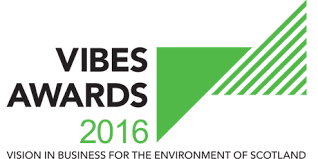 The Vision in Business for the Environment of Scotland Awards recognise and reward good environmental practices that reduce the negative impact on the environment whilst providing economic benefits to the business. We are looking for entries from all sizes and sectors of business whose internal processes, products or services make them worthy of this recognition. Our 2016 categories are: Best Innovation (2016 themed award), Management Large and SME, Best Environmental Product or Service, Transport, Circular Economy, Green Teams, Best Micro Business and a special charity award in collaboration with WaterAid.